All companies that run on credit and debit card payments need a merchant account, but some find it harder to get approval. 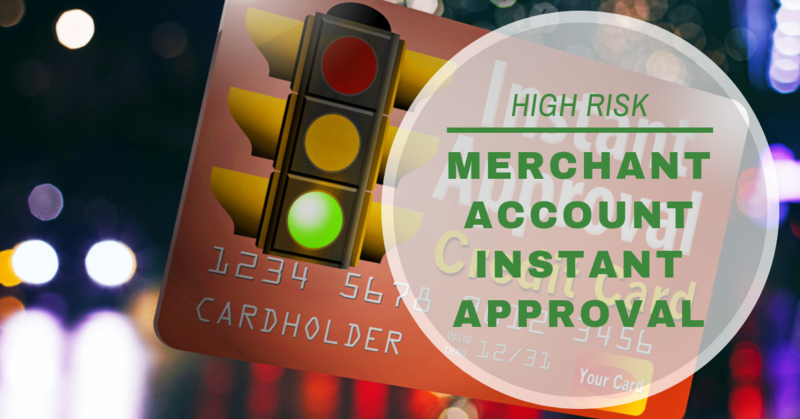 Companies that don’t qualify for traditional processing agreements should look for providers who offer high risk merchant account instant approval. Merchant accounts transfer funds from card-issuing banks to merchants’ business accounts which allows for quick, reliable payment processing. Major card networks like Visa, Mastercard, and American Express charge fees to use their network. Merchant Service Providers (MSPs) also charge processing fees in order to connect the card-issuing bank to the acquiring bank via payment processors. Without a merchant account, businesses can’t accept any credit or debit cards. What’s A High Risk Merchant? A “high risk merchant” can be a company that operates in a risky industry or comes with certain liabilities. When business owners apply for merchant accounts, there is an underwriting process that estimates the approximate risk of a business, similar to applying for a loan. Providers look at the type of business, personal credit history, company financials and history, and how many years the company has operated to determine the level of risk. They also look at merchant account history, chargeback rates and volume, and the company’s standing on the MATCH list or Terminated Merchant File (TMF). Companies that sell adult products or services are considered high risk along with those that run on free trials, recurring billing, or membership-based models, such as dating websites. Business liabilities can refer to fluctuating volume due to seasonal revenue, a need for multiple merchant accounts, or multi-currency processing due to international target markets. They can also refer to companies in emerging industries, like Bitcoin mining. High risk merchant account instant approval helps ensure that businesses with liabilities can process payments seamlessly. Specialized providers offer stable internet merchant accounts for instant credit card processing. Working with a high risk specialist that has the industry knowledge and track record to set up high risk businesses anywhere in the world has numerous benefits. While many payment processors avoid high risk businesses for fear of their bottom line, specialists provide fast and affordable merchant account solutions for any liability. Good Credit Score. This not only indicates that you have a good credit history and make payouts on time but determines the discount rate charged for each customer credit or debit transaction. Current Funds. Healthy bank accounts are an excellent sign for a business and help provide stability for the future as well as indicating the success of the company itself. Your Bank’s Industry Experience. If the acquiring bank (which houses your business accounts) has experience processing transactions for your industry, that’s a big plus. Valid Identification. All important personal and business information, including driver’s licenses and passports, must be up to date. Complete List of Documents. Make sure any documentation like KYC documents are in order and ready to submit for underwriting purposes. These factors can help increase your chances of getting approved for a merchant account with no delays. Just remember that part of the process is obtaining approval from the acquiring bank, which can take several days or up to several weeks. Discuss your growth projections and current volume caps so we can put together a plan that will help you achieve your goals. Provide ongoing review of your merchant accounts to ensure good standing while we act as your merchant advocate and help ensure that you’re getting the latest industry trends. Getting a merchant account for credit card processing is a win-win situation for both providers and merchants. With high risk merchant account instant approval, it’s more than possible for businesses of all sizes to succeed, no matter what the risk. Fifteen years of high risk merchant experience means we’ve tailored our excellent client services to our customers with low fees, quick approvals, and industry-leading support. Let’s talk.